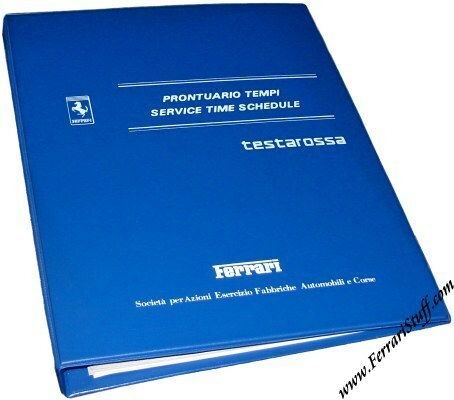 Ferrari factory original 1985 Ferrari Testarossa Service Time Schedule or Prontuario Tempi as it is called in Italian. Comes in factory original blue binder with silk-screened text in white. 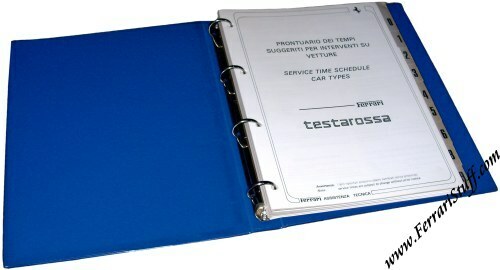 This Ferrari Workshop Manual covers both the US and the European versions. The pages are Black and White. Ferrari Print Number 351/85, issued in 1985, printed in Italy. Exceptionally useful for the Ferrari home mechanic as it indicates how much time a qualified Ferrari technician is allowed to spend on maintenance and repairs tasks, giving a good impression of how "big" the task at hand really is.